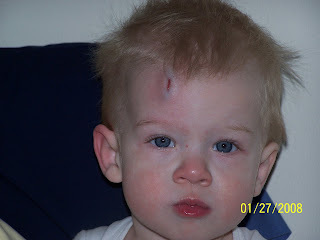 Poor Preston...he was trying to get off our bed (Ash was "helping" him) when they both let go at the same time and he fell-right on his face-and right on to the edge of a very small picture frame. Ouch! He has the biggest nugget on his head! 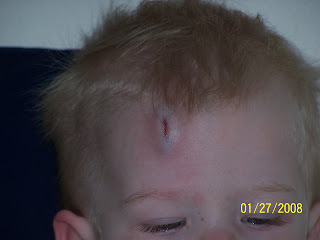 Thankfully it barely bled so I don't think he need a doctor...we'll just watch it and see how it goes. He did let me put a package of frozen peas on it for a bit. 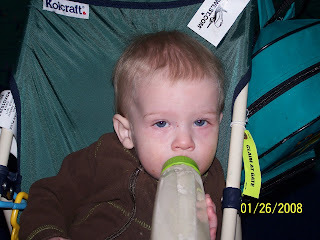 Poor Preston-this on top of having the flu.... :( so sad! 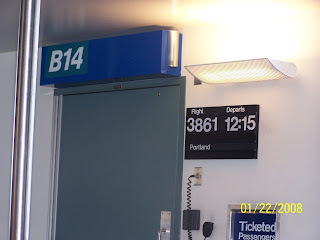 Yipee, we finally get to go to Vancouver! And our trip begins. After our flight being canceled the day before, it was nice to finally be at the airport and be on our way to Vancouver! It seems Ash is able to make friends wherever we go-she became attached to this little girl-Olivia-who is only 1 month older than Preston. 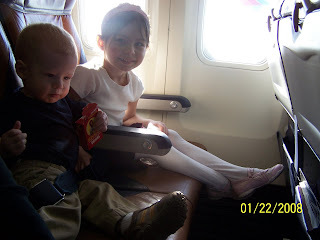 The kids were all smiles and so was I-the flight was pretty empty so we had the whole row to ourselves! I don't think the camera adds 10 lbs, I think it just adds chins. :) Oh-well. Look how excited Ash is to be going on a trip! 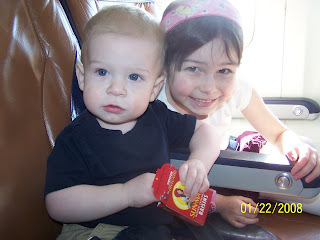 Preston ate that entire box of raisins in about 20 min....They both loved having their own seats on the plane and so did I! 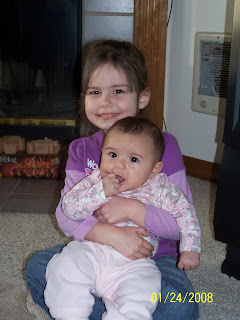 My kidlets. I am glad I could go on this trip with them! So much fun!!! What I wish I had gotten a picture/video of-the girls-Bridget and Ashleigh actually RUNNING to each other in the airport when we arrived! It was unbelievably cute!!! We did a little sight seeing on our way to Emily's house. 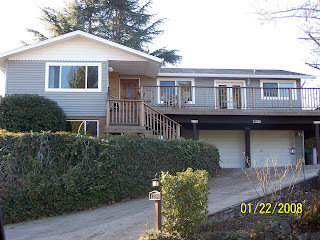 This is my parents old house in Vancouver-we lived here for almost 20 years! Lots of memories here. 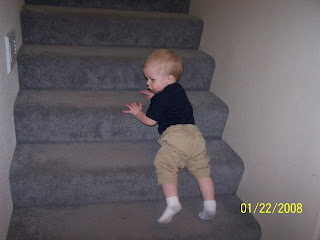 Preston learned how to do stairs just a week or so before our trip-I'm glad since there are stairs at Em's house. By the last day, the front of Preston's calves were all red and scratched up. 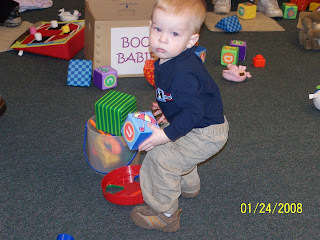 :) He sure had fun playing in all the room they have! 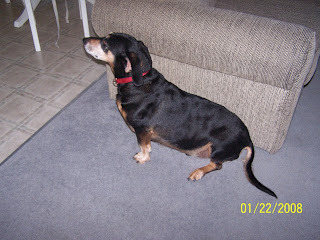 This is Jeffrey-He used to be my dog, that is, I bought him from the humane society, but soon decided I didn't want him and Emily happily took him. He's getting so old, but is still such a loving dog. Preston learned how to say "doggie" while we were there! Thank you Jeffrey! 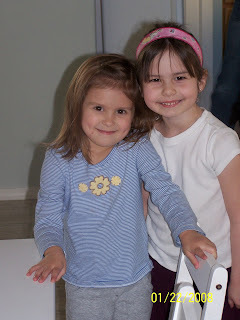 Lovely cousins-Bridget and Ashleigh...Aren't they cute?!? 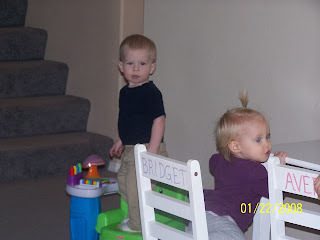 Preston and Avery-they loved playing together! 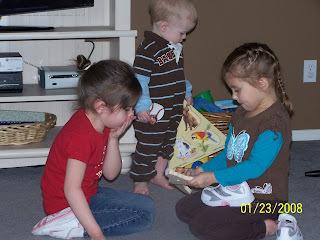 Ashleigh, Preston, and Bridget playing. 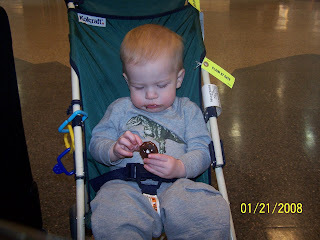 Preston LOVED this little chair toy. I am going to have to buy it. 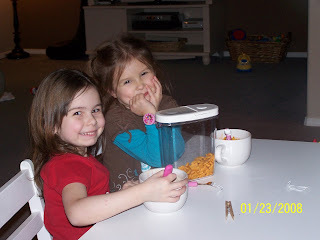 I am so glad that Preston and Avery got along so well! "Look how cute we are, mom!" I love this picture! 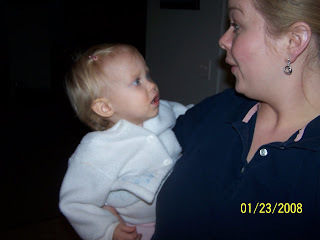 Avery and Me. She warmed up to me pretty quickly-I am SO glad! 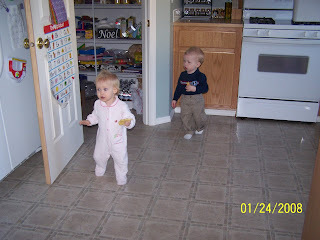 Avery and Preston in the morning-before going to the library. They are just little people. I love it! 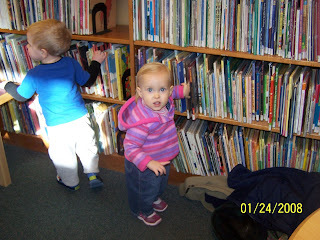 On Thursday in Battle Ground, WA I took the babies to the library for story time. It was my first time out with "twins". 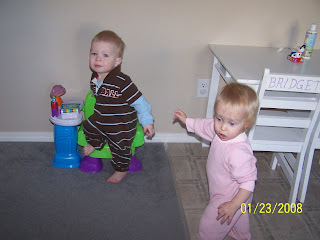 Preston and Avery are only 3 months apart in age, so it was more difficult doing everything myself-getting them in and out of the van, in and out of the library, trying to keep track of them both when they decide to run in different directions-which one do you go after first? Actually, it was a lot easier than I had anticipated and was WAY more fun than I thought too! 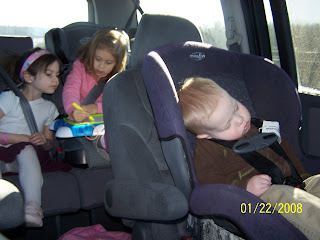 Both kids did great and although their attention span is not long enough yet to really enjoy story/fun time, it was still a lot of fun taking them and enjoying it with them! 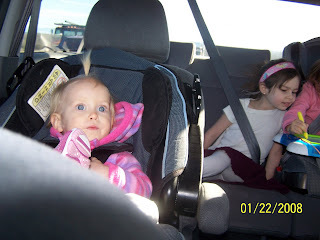 Avery is SO inquisitive! 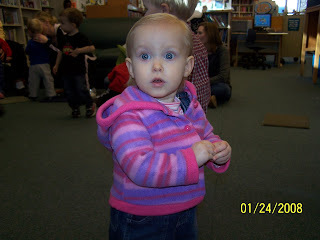 She observed people a lot and did a great job of paying attention. I loved it because it definitely reaffirms that girls are MUCH easier than boys!!! 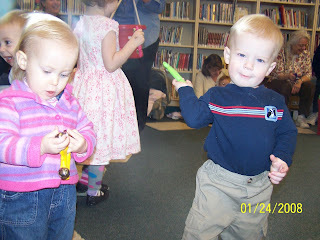 Both kids were busy at one point or another with taking the book off the shelves. 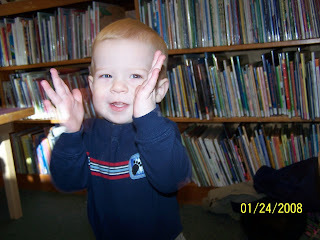 Here's the difference though-with Avery, I removed her from the temptation once and she stayed away, whereas Preston went back repeatedly when I tried to keep him away...he did NOT like being kept from those books! 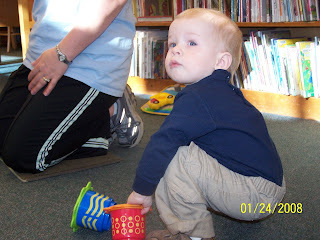 Once story time was over the kids could play with toys, book, etc for a bit. 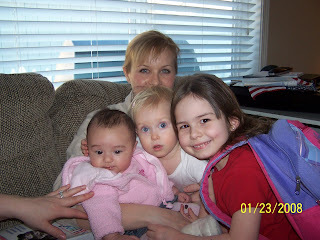 My second and third days in Vancouver I was able to spend a few hours with my childhood best friend, Vanessa, her family, and meet her first baby-Liliana who is 3 months old. 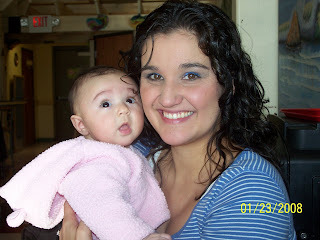 I was blown away by how beautiful they both are and by what a sweet loving baby Liliana is. 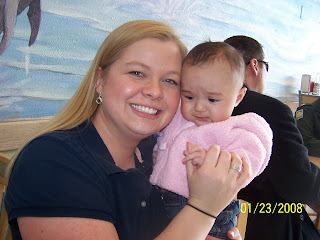 Vanessa is an amazing mom-there must be something to waiting until your mid/late 20's before starting a family! 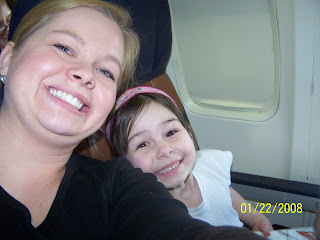 I absolutely adore this little girl and I am so sad that I won't see her again for at least a year! Ugh! We went back to Emily's house so we could visit longer. 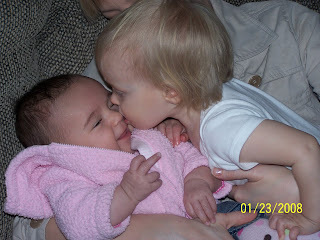 Both Bridget and Ashleigh fell in love with Liliana, but Avery was the most interested I would say... They are only 10 months apart in age. 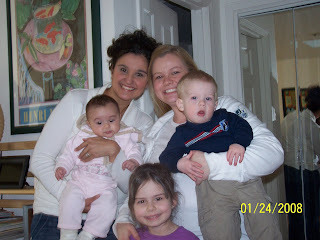 The next day, I met Vanessa at her dad's house and was able to visit with her parents. 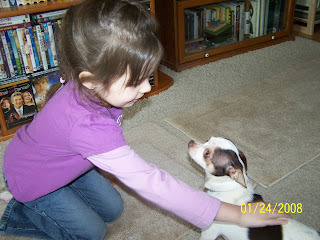 Ashleigh fell in love with Vanessa's dog-Mr. Big. 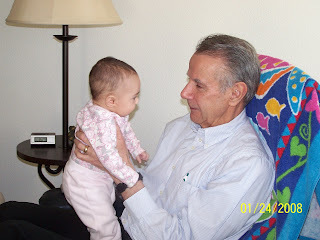 Vanessa's dad, Jack, holding Liliana. He is a totally proud grandpa! 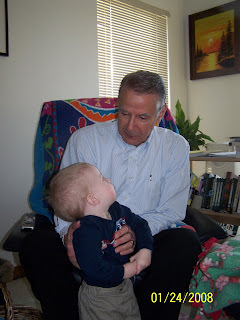 So great to see how much they dote on their granddaughter. Jack and Preston.... Preston had a hard time keeping his hands to himself while we were there...too many interesting things to play with that are NOT meant to be played with-ya know what I mean?! 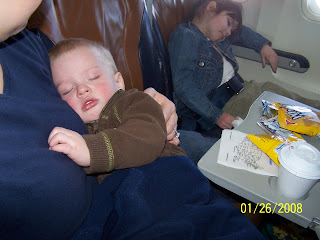 My poor kids got sick with a fever-flu the day before we were to head back to Utah. Consequently I didn't take ANY pictures for a whole day and we weren't able to do any of the fun things that were planned for Friday! I was very disappointed, but who can blame them?!? They both look so pitiful!!! Yeah, they are both asleep! Woo Hoo! So fun day at the airport today. We got up at 6am, saw that it had snowed about 6" over night-and was still snowing and decided we had better leave a little early so we can get through traffic. We actually made good time considering that other people are morons on the road and in spite of them getting snow year after year, they still have no clue how to drive in it! 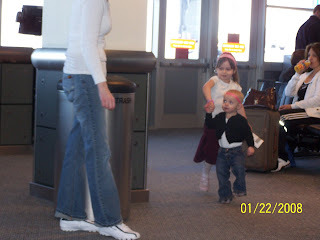 The line at Southwest was completely empty-YIPEE-I found out my flight would have only about 50 people on board-definitely a plus when flying with 2 kids! I made it through security just fine. The kids were doing great! 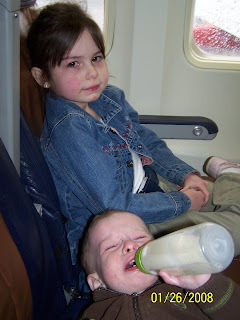 Then we hear that the flight we are waiting on from Denver had been delayed. Then we hear that a plane had gone off the runway! Then we hear that they are only using 1 runway for ALL departures AND arrivals! Our plane ends up arriving from Denver 45 min late. 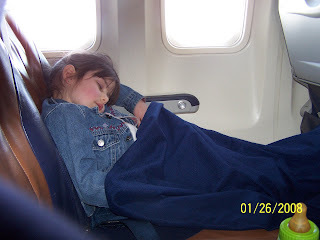 About 10 min after they land, we hear that our flight to Portland has been canceled and that the airport is CLOSED!!! So, I had to call Nick-who had just made it to work 30 min prior-to come back and pick us up. Thankfully, I was able to book a flight for Tuesday-COMPLETELY FULL FLIGHT :( and will be coming back on Saturday instead of Friday. sigh. 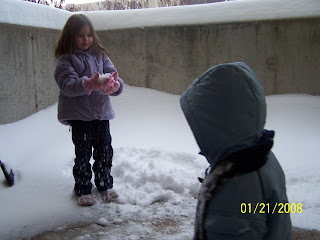 The good news is, it snowed most of the day today so the kids went out on our patio and played in it and then after work we went to the Call's for FHE and went sledding behind the truck! I was finally brave enough to go by myself and I am SO glad I did...it was SO much fun!!! Ashleigh even went doubles with Nick. It's her first time going, and I was so proud. :) So, a disappointing day definitely turned out better than I had hoped. Here's hoping we can get out of town tomorrow though! Cheers! 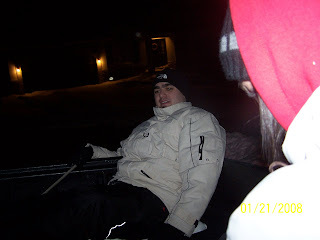 Nick in the back of the truck waiting to sled....SOOO much fun!!! 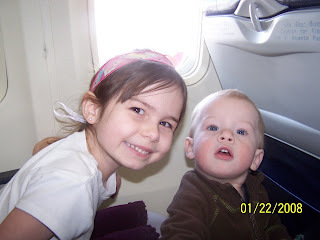 I am going out of town to visit my sister Emily on Monday...I will be gone for 5 days so won't be posting. I'll catch you all up with LOTS of pictures when I get back.... Thanks for keeping an eye on my blog. It's really fun to keep a journal like this! I had so much fun today. 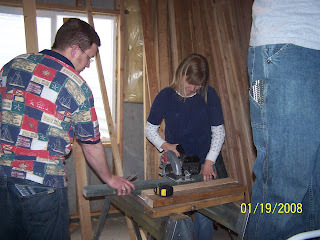 My sister Tamsen and I ambushed my brother over Christmas and told him that we were all going to come over to help him finally finish his basement. They are expecting baby #5 and definitely need the room so he can't put it off any longer. We all met this morning at Kevin's house-Ryan, Tamsen, Todd, Nick, Me, Jana's brother Brett, and Nick's dad, Randy all came to help! I helped a lot at first but then decided that there were "too many chefs in the kitchen" so I stepped back and let the others take over. 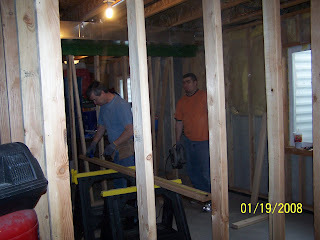 It was fun to watch the dynamic between everyone and to see them all work together to help get the basement finished. 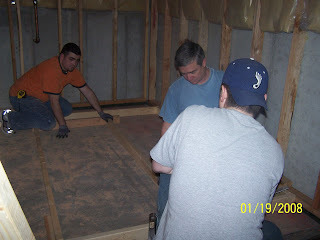 Silly me, not realizing how long it really takes to get a whole basement finished, I actually thought we would get it done in 1 day, but no, we'll be back to help again, and again, and again...until its done. The baby will be here in July, so we have a few months. 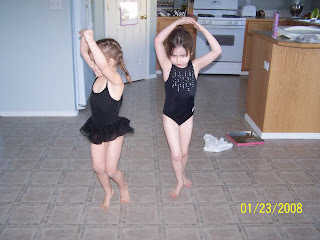 :) It was tons of fun though! 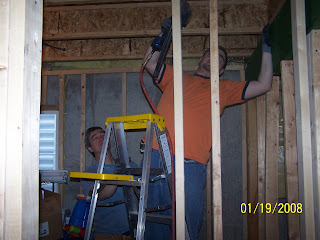 Randy and Nick-they did one of the closets! Wow, that was a major undertaking-SO glad to have someone experienced so willing to help us! THANK YOU!!!!! Randy gave Nick lots of opportunities to "help". Nick learned a lot working on this, and I know he really enjoyed spending this time with his dad! I know I loved seeing them work together! 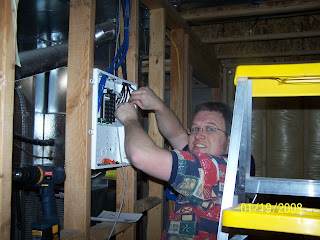 They did a great job working on the wiring! I got so confused just watching them! 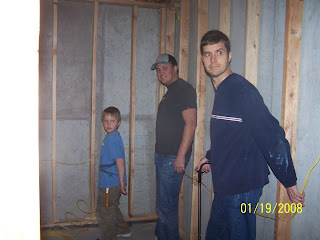 After Nick and Randy finished the closet, they came to help finish framing the last wall/door. The measurements kept coming out wrong! So funny. They all did a GREAT job! 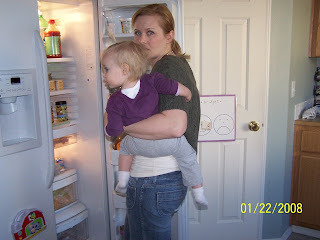 My sister-in-law Jana is one in a million-she pretty much watched ALL the kids while the rest of us worked. 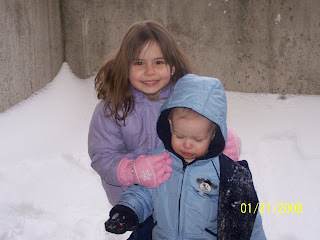 The kids made blanket forts, and played outside in the snow, and actually did an amazing job being together for so many hours. 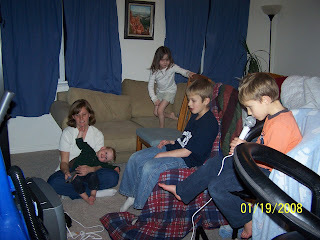 Here they are playing American Idol Karaoke.